Surprisingly, our bodies do not stay the same as we age. For almost four years Mary has been living with a discomfort that is specifically feminine and greatly aggravated by riding. Short rides have been a chore and long ones have been excruciating, sometimes resulting in painful, broken blisters. I mention these details only in the interests of other female riders who may suffer similarly. Various remedies have been tried, including changes in the bike setup, etc., etc., all to no avail. 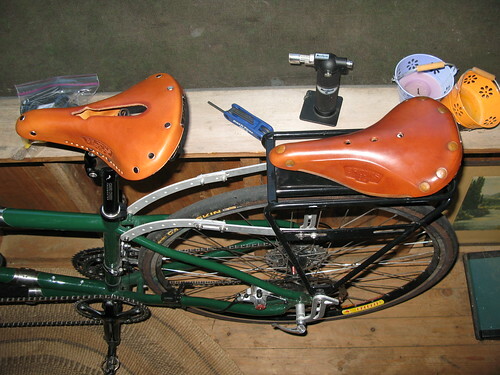 I showed Mary the post of the RIDO bike seat which she found very interesting. However, vanity ruled. She did not want to give up the honey leather saddle on Lady CoMo. What she did find, once she started looking at saddles, was the cutaway version of the B17S. The "S" (for short) is considerably shorter than the standard B17. We took care to break in the saddle using Garry Lee's tried-and-true method (place saddle on floor, stand on it with both heels, repeat often). Since we changed to this saddle Mary has not had even the slightest hint of discomfort. Nothing. The cutaway has been a dream. It is hard to believe the change has had this great an effect. Better yet, I now have a spare B17 for myself. I may even try cutting it out 🙂 . The other element of comfort for the stoker has been the ThudBuster seatpost which JJ convinced us to buy when we got Lady CoMo. The ThudBuster works by compressing a trapezoidal rubber insert to absorb shocks. (There are different rubber inserts for different rider weights.) This is very important for the stoker since she cannot anticipate bumps in the road. For us it has been very effective. In the year we have had Lady CoMo Mary has not complained once about a bump. 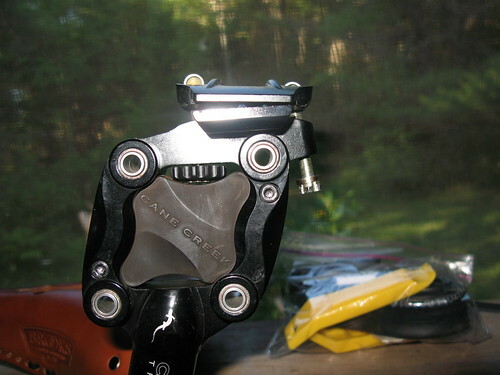 One feature that I like about the ThudBuster is its adjustment mechanism. You can see in the photo a knurled knob in the top centre and a second adjusting screw at the rear. These two screws in combination allow you to fine tune the tilt of the seat. It is much easier to adjust than the standard ribbed fittings. Comfort is important. I think we have a winning combination. Posted by Kern on August 5th, 2012. A good solution Kern. Brooks honey leather is very distinctive and looks great with the green frame. I'm not sure about cutting a slot in a standard B17 though. Is are yours not comfy? I have found that my B17s have become quite soft, especially after they have got wet and been ridden on, to the point where they might need some side laces to stiffen them up (that works – I've never fancied tightening the front bolt as you are really just stretching the leather). Cutting your B17 would be a last resort I think. Like the idea of the thud buster too – even the name is great! Shedman never bothers to tell me when a bump is coming up... some of them really rattle the jaws 🙂 As he never rides stoker, I dont suppose he would find it of much use (roll eyes). I'm glad Mary has found a comfortable saddle and as others have said the tan Broooks looks great with a green bike. 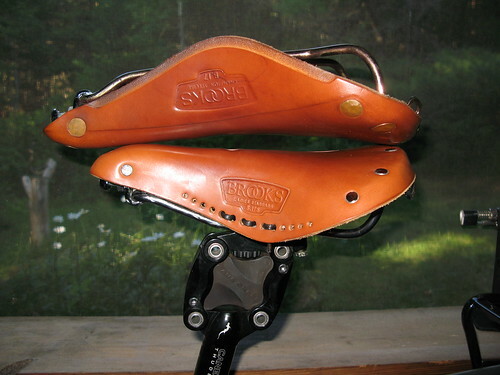 I can't understand why Brooks make their women's saddles shorter than the men's. Wider is logical but why shorter? It means there is almost no room for adjustment. I did toy with the idea of a cutaway one myself but vanity prevailed – they don't come in blue! Having said that its now darkened so much its hard to tell it isn't black!